Chris proposed the day he moved to New York City. Our engagement began with three months of a long distance relationship between NYC and Maine. When we finally lived under the same roof full-time again, all I wanted was to hang out with him, have fun, and bask in the glow of knowing I'm lucky to marry my favorite person. For the last few months, wedding planning took the form of daydreamy conversations and a few e-mails to potential venues. We were focused on figuring out life in New York City together and didn't mix in the stressful process of planning an out of state wedding. But now, as I get more and more excited to marry Christopher, and as more friends and family ask, I'm wading slowly into the waters of wedding planning. I'm determined to keep it stress-free so I've broken down phase one into five steps. So far, so good on the stress-free side. Thank you to Basic Invite for sponsoring this post. Basic Invite is an invitation and stationary company with beautiful customizable invites and websites for every occasion. I'm excited to collaborate with Basic Invite on this post because I know their wedding invitation suites, free wedding websites, address collection service, and other products will make my out of state wedding planning experience so much easier. How do sponsored posts work? Read all the finer details. Basic Invite provided some lovely stock images of their invites and I had some fun with their online wedding invitation creator to customize the look. This is the Type Frame Portrait design. 1. Make a guest list. Get super familiar with Google Docs and Google Sheets as you start planning your wedding. If you have a Gmail account, you already have access to free word processing, spreadsheets, and other documents through Google. They're shareable and you can edit from any device, so Chris and I are always on the same page. On day one of wedding planning, I cracked open the Google Sheets to draft our guest list. Making lists is cathartic to begin with, and making a list of every possible invitee organized my brain. I also knew that our guest list would impact our venue choice, so with a potential head count down on paper, it made the wedding venue search more realistic. P.S. It's easy to delete people from a Google list. Just saying. 2. Pick a rough date range. Chris and I aren't *married* to a specific wedding date. Heh. We know we want to be in Maine, in late Summer, in 2019. A flexible date range is key for an out of state wedding, especially when you don't have the flexibility to view venues whenever you want. Our guest list will narrow the size and location of venues we can choose from, and from there we can work within the availability of our favorite spot. I definitely don't have an address book. I'm not even confident I could recite my own mother's address with any degree of accuracy. Thankfully, I can make the tedious task of collecting guest addresses somebody else's chore. Basic Invite, a custom invitation and stationary company, features a free address collection service that breaks it down into three simple steps. You share a link with your guests (mine will go out on the family e-mail chain), your guests securely enter their address and contact info, and when you order your luxury wedding invitations with Basic Invite, they'll print your envelopes for free! Seamless address collection and printing, no handwriting addresses required! 4. Build a free personal wedding website. Sending beautiful paper wedding invitations is a special wedding tradition, even when snail mail is losing it's popularity to online communication. One contemporary wedding tradition I love is building a personal wedding website with Basic Invite to enhance those beautiful paper invites. One thing not on my list of first steps is engagement photos. As soon as I plan a shoot, I'll add cute shots of Chris and I to our wedding website. For now, this couple is a decent stand in. Not as cute, but bear with me. Creating a personal wedding website with Basic Invite is a dream. 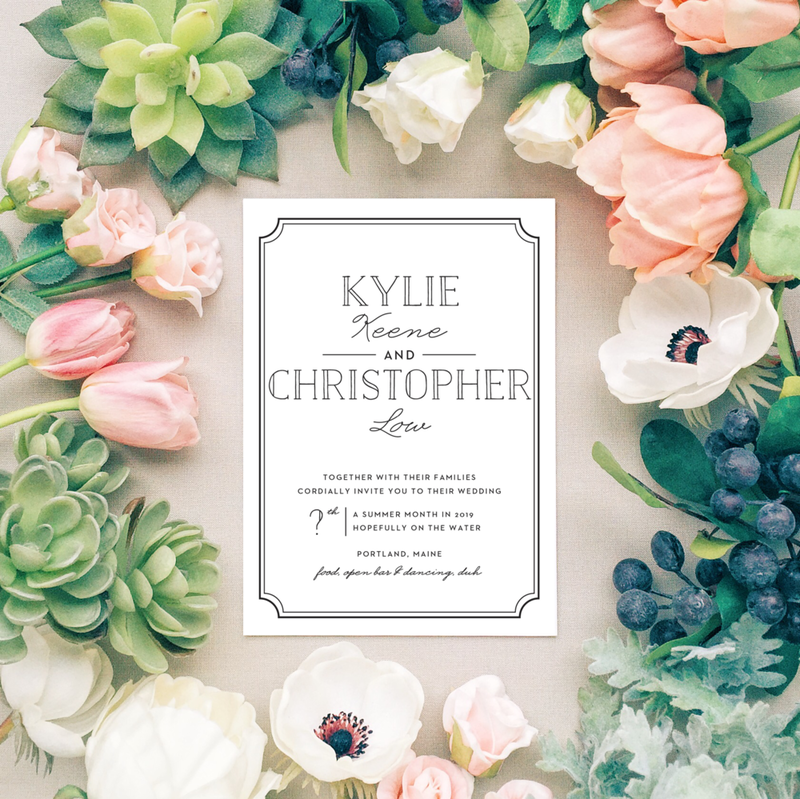 The URL is customizable and you can coordinate the colors, font, and layout with your wedding invitation suite. Your site can feature all of the important time and location details of the big day, even a map with directions to the venue. Basic Invite's free address collection service is integrated with your wedding website and guests can RSVP on the site, too. One link for all of your wedding details. So simple. 5. Treat yourself to a wine and Pinterest night... With your fiancé. I didn't grow up dreaming of my perfect wedding. In fact, Chris and I both kind of hate traditional weddings and we're may more excited about the end result (you know, being together forever) than actually planning a cliché big day. Instead of making it a stressful decision-making marathon, we're using our wedding as an excuse to plan a big party together. This week, we're going to polish off a bottle of wine and throw all of our wildest ideas onto a Pinterest board. Just like our guest list, some things will be crossed off in the process, but at least we'll have some fun looking at wedding-appropriate bounce houses and donut cakes. I could get lost for hours exploring the stunning designs and amazing selection of products from Basic Invite. I was instantly impressed with their perfectly on trend but classic themes for every occasion invite, but especially for the totally Pinterest-worthy options for luxury wedding invitations. Their new clear collection is so unique and I love all of the envelope color options. Before I was introduced to Basic Invite, I thought I'd have to take on the task of designing our wedding invitation suite myself to get the completely custom look I want. The online invite designer is simple, clean, and provides virtually unlimited custom options, even when working with their many design templates. The Deco Type Foil design, customized with our TBD wedding details.